I haven't read this book, but I admit I'm intrigued by John's description of it. "Unrhymed iambic pentameters -- the most difficult kind of English verse to write acceptably; a kind, therefore, much affected by those who cannot acceptably write any kind." 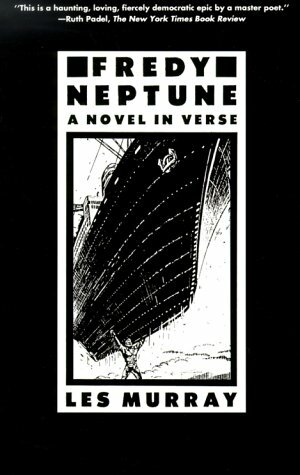 Les Murray's "Fredy Neptune," a novel about the life and adventures of a German-Australian seaman in the first half of the 20th century, is 255 pages of blank verse. Furthermore, it is blank verse in the service of a theodicy that makes use of ground-level descriptions of just about every major bad thing that happened from 1914 to 1945. Bierce would have approached such a work with understandable trepidation. The wonder is that this is an excellent book, one that revealed to me things I did not know about the narrative uses of poetry. (You can get an amazing amount of action into a very few lines, for one thing.) The only drawback to "Fredy Neptune" is that it may tempt lesser writers to produce verse novels of their own; they might do themselves an injury in the attempt. In addition to his name, Fredy has two chronic problems. The first is that, as the son of a German family in the era of what some English historians persist in calling "the German Wars," he and his loved ones are frequently ostracized from Australian society. His other chronic problem is that, because of a temporary case of leprosy contracted in the merchant marine, he is almost wholly without sensation in his skin. His inability to feel pain permits him to appear to be enormously strong, though in fact he simply cannot feel the damage his feats do to himself. The Depression was a Bad Thing, too, so Fredy, blackmailed by a criminal syndicate into doing a bit of kidnapping for them, goes to America to get a good look. This was the only part of the book that struck me as blatantly literary. A string of Fitzgerald adventures, Faulkner adventures and Steinbeck adventures bring Fredy from a nest of gangsters in Appalachia, though the hobo-jungles of the West and on to what might in other circumstances have been the beginning of a promising career in Hollywood. A minor miracle (not the only one in the story) promotes Fredy from movie-crew best-boy to a zeppelin crewman. This gets him back to the Fatherland, where he has various fallings-out with the Nazis. He also acquires an adopted son when a retarded boy asks him for directions to his place of sterilization. Back in the southwest Pacific for World War II, Fredy sees more than his share of pillage and atrocity from Shanghai to New Guinea. Still, by the end of the war, his life falls into a welcome routine, eventually achieving as much respectability as is consistent with running a trucking business founded on the shipment of black-market gasoline. He even achieves inner peace, getting his outer sensation back in the process. There is a fair amount of showing off in "Fredy Neptune," particularly with languages. There are not many other books that have snatches of dialogue in both Turkish and Welsh. For the most part, this feature is put to good effect. The strongest line in the book is in German, when Fredy tells his gravely-wounded natural son that the boy's 71-year-old grandmother has just burned to death in the bombing of Dresden. Still, while "Fredy Neptune" is never willfully obscure, readers may have trouble distinguishing the historical personalities from the fictional ones. Certainly I did. It is hard to mistake the walk-ons by Marlene Dietrich and Lawrence of Arabia, but who was the villainous Sir Peter, minister of something or other at Brisbane, who coerced Fredy to take ship for New Orleans? And was there ever really a Dowager Countess Chlodwig-Wahnfriede von Rauschnitz zu Knull, who ruled a vestigial Ordensstaat in the Baltic and had a soft-spot for shipwrecked mariners? History is as full of mysteries as fiction. All in all, Fredy sees an appalling amount of unhappiness, so much that he describes all of Eurasia as a great execution trench. A helpful Jewish friend, successfully escaping with his family from the Vichy-French concession at Shanghai, nevertheless drowns himself before his ship reaches Australia. He sends Fredy the explanation: "Noah couldn't bear to look at the drowned." This brings us to Murray's own outline of a theodicy for the first half of the 20th century. Fredy is an ordinary Catholic. He even goes to confession once or twice in the novel; the descriptions are models of how it should be done. What worries him is not the existence, but the sanity of God. Fredy knows from his own experience that the only way to survive a beating is to pretend he is being hurt, since even a very cruel human being will eventually recoil from inflicting pain. God, however, does not. Whatever His purposes may be in allowing suffering in the world, they override every other consideration. Fredy's numbness is a way of dealing, not with his own suffering, but with the suffering of the victims. Fredy's solution to the problem is to forgive the victims. Forgive the trapped Turkish troops being strafed day after day, forgive the Jews in the concentration camps, forgive his own mother in Dresden. Fredy also forgives God, who in Christian theology will never cease to suffer for our sins. Is this a self-indulgence, a proposal that we need not trouble to have other people's misfortune on our conscience? Or is it a recognition that it is wrong for individual human beings to try to take the whole world on their shoulders, that this is not what compassion is for? Murray, wisely, does not try to develop a philosophical case for Fredy's solution. Maybe someone should, though. Rudyard KiplingThis month 50 unpublished poems by Rudyard Kipling will be released. Kipling is one of my favorite authors, so I look forward to these unseen works. Kipling is a jingo imperialist, he is morally insensitive and aesthetically disgusting. It is better to start by admitting that, and then to try to find out why it is that he survives while the refined people who have sniggered at him seem to wear so badly. I am reminded of Orwell's low opinion of Waugh's Brideshead Revisited, commonly regarded now as Waugh's greatest novel, while Orwell thought it was his worst [Orwell was dying at the time]. Maybe the common theme here is Orwell was unable to see past his disagreements with other authors of comparable stature. I find Kipling and Waugh better than Orwell, although Orwell tends to rank higher in reading lists than either of them. It may be because Orwell is required reading for the educated classes in the English speaking world, while Waugh and Kipling are less commonly assigned. I certain know few who read 1984 for fun. I think Orwell's essay on Kipling is worth a read. He was a hell of a writer. Kipling is simply closer to my heart, and I think closer to the truth than Orwell was. Among my favorite authors assuredly belongs Kipling, the engineer's poet. Kipling is often derided as an imperialist, but he was both popular and critically acclaimed in his day. His use of dialect is part of the reason he was awarded the Nobel Prize for Literature, but also for his love of his subjects. I took a course in Asian history in college. There was a 5-week section on India, but I think I learnt more of what India is really like from Kim. Kipling captured the color and energy and maddening diversity of India in that book, and I think it was the better introduction. And lay their new-cut forests at your feet ? Or plant a barren wilderness with wheat ? And irrigate your orchards as it flows ? One of my favorite poems, by Robert W. Service.